How Long Does Invisalign in Washington, D.C. Take? For years, traditional braces were your only option to get a straighter smile. These not only hurt the appearance of your smile, but they can be uncomfortable, painful, and cause you to change your diet. With Invisalign in Washington, D.C., you can straighten your smile in the most comfortable and discreet way possible. Read on to discover how long Invisalign treatment takes and what the process is like from a trusted dentist. Invisalign treatment uses a series of clear plastic aligning trays to gradually shift your teeth into position. You’ll wear each aligner for around 1 to 2 weeks, and then you’ll switch them out for your next pair. At the beginning of the treatment process, your dentist will take a digital map of your teeth, where they can plan out how your teeth will shift, creating the series of aligning trays accordingly. Your aligning trays should be worn 20 to 22 hours a day. Because they are completely removeable, you can eat all of your favorite foods without worrying about them getting caught or damaging your braces. Just make sure to clean your mouth before putting your trays back in. On average, Invisalign treatment can take 6 to 12 months, which is typically a shorter time than traditional braces. Some can even notice straighter teeth after 2 weeks of using their aligners. The time it takes for your treatment will depend on the severity of your misalignment. The length of your treatment will also depend on how diligent you are at wearing your aligning trays. The more you wear them, the faster and more successful your treatment will be. 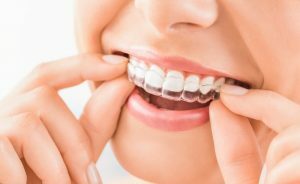 That’s why Invisalign is usually recommended to adults and older teens because younger children don’t have the responsibility to wear them for over 20 hours a day. What Are Some Benefits of Invisalign Treatment? As mentioned above, the biggest benefits are the comfort and discreetness that Invisalign provides. Your aligners are custom-made for your mouth, and they’re made out of plastic to give you the most comfortable wearing experience. Additionally, because they’re made with clear plastic, the only people that know you’re straightening your teeth will be you and your dentist. This means you can go about your social and work lives without being self-conscious about your smile’s appearance. Does it sound like Invisalign is right for you? Now that you know how long it takes and what the process is like, contact your dentist to get started on a beautifully straight smile. Dr. Yelena Obholz is a highly-trained dentist who has a passion for providing quality care. She takes pride in offering Invisalign to her patients to deliver them a straight smile without using traditional braces. She currently practices at Aesthetic & Family Dentistry of Washington, and she can be contacted through her website or by phone at (202) 364-8989 for any questions. Comments Off on How Long Does Invisalign in Washington, D.C. Take?